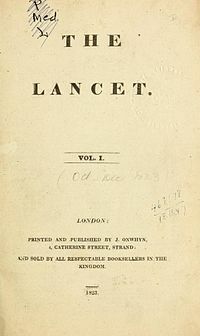 ^ About the Lancet Medical Journal （英语）. ^ Les Roberts, Riyadh Lafta, Richard Garﬁeld, Jamal Khudhairi, Gilbert Burnham. Mortality before and after the 2003 invasion of Iraq: cluster sample survey (PDF) （英语）. ^ Scientists estimate 100,000 Iraqis may have died in war. USA Today. 2004-10-28 （英语）. ^ Cancer study patients 'made up'. BBC News. 16 January 2006 （英语）. ^ Cortez MF. Medical Journal Retracts Oral Cancer Studies Linked to Fraud. Bloomberg.com. 1 November 2006.